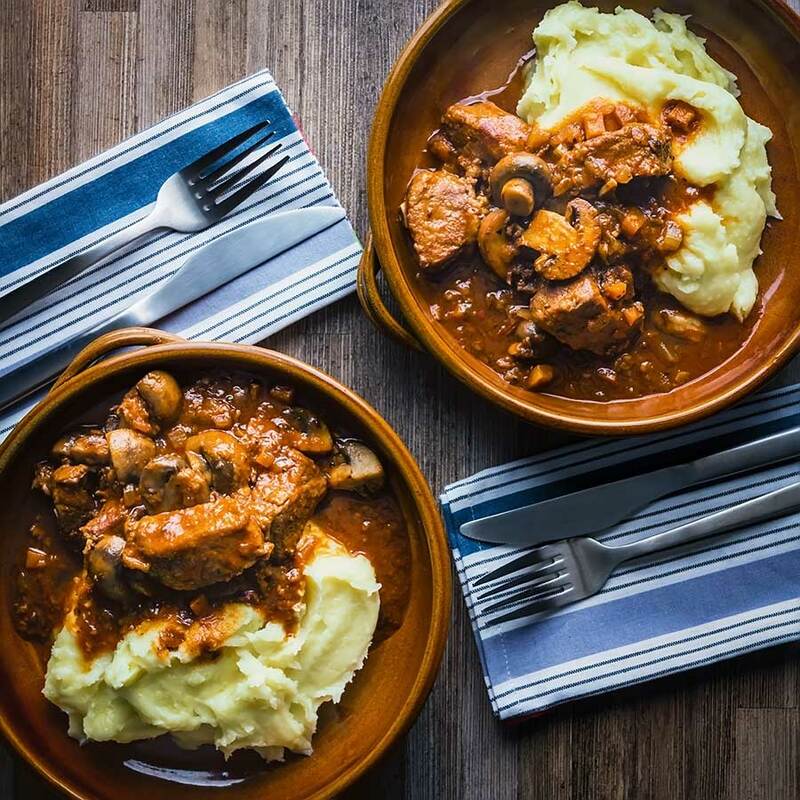 Wild boar is a fantastically underused meat that makes the most wonderful autumn or winter meal, this wild boar stew really showcases its flavour! 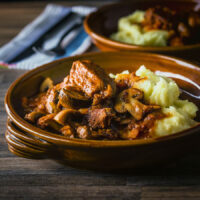 Slow Cooker Wild Boar Stew. We get access to some wonderful game out here in the Hungarian countryside. 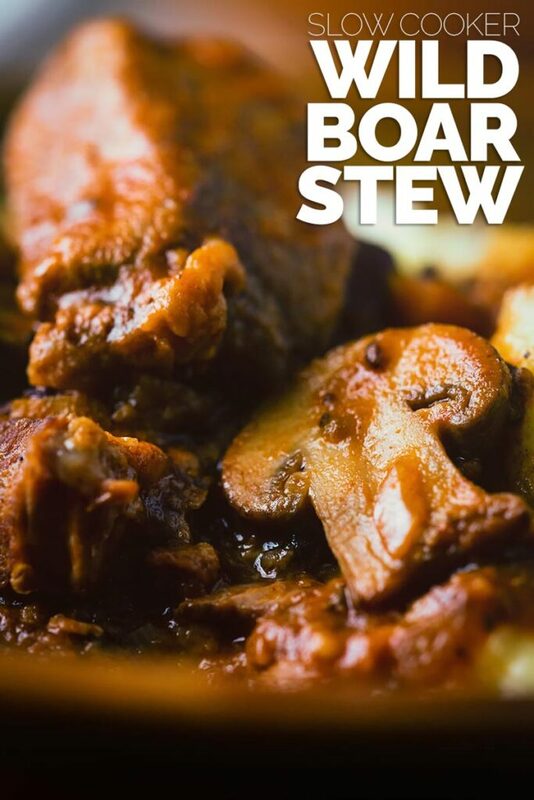 This wild boar stew is one of my very favourite Autumn and Winter stews. I have been a little reluctant to post game or offal here as I know they are not exactly the most popular or even easiest cuts of meat to get your hands on. However, you have all been here a while now and know that I am not one of those weirdo Bear Grills (is that even his name) type of cooks. I am definitely a cook that loves to cook with game, pheasant, rabbit, deer and wild boar are all tops of my ‘nom nom’ list. So here is my first foray here on Krumpli into the world of game cooking a wild boar stew with mushrooms. Now don’t worry if game aint your game or you struggle to find it. I make this exact same dish with shin of beef. The only difference is I cook it for a couple of hours longer in the slow cooker and it rocks! Well, the simple answer is, erm… Wild Boar. If you are expecting pork then you will be surprised. I guess the closest I can think of is a cross between pork and beef. Wild boar has very little fat and I love to slow cook it, I have tried faster cooking and it has not quite worked out. In order to cook wild boar quickly, you need to score the meat of a younger boar which is difficult guarantee with wild meat. 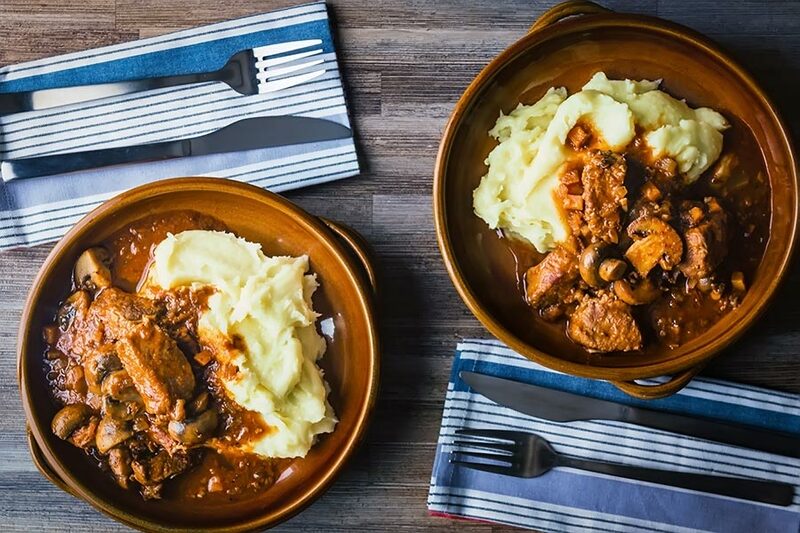 This wild boar stew cooked in the slow cooker works perfectly. The meat is fork-tender, aint no need for a knife with this bad boy. In all fairness, there is little need for chewing it just kinda melts but still has a texture. I only wish that I could get my hands on some fresh or even dried porcini mushrooms but that is not to be out here. Using chestnut mushrooms works an absolute treat. This wild boar stew is definitely influenced by where I live. Stews in the UK tend to be very vegetable heavy like my British Beef Stew with Dumplings. This however, has much more in common with a Hungarian pörkölt a slow-cooked meat dish made from frugal cuts of meat. Generally cooked long and slow with a thick heavy sauce. Definitely a dish I will be sharing with you at some point in time over winter. Many of the flavour profiles in this dish are full on Hungarian pörkölt or gulyás. Everything from the caraway to the paprika through to the tomatoes and the wine. In fact, a good trick if you are using beef in this recipe, particularly shin of beef would be to marinade the beef in the wine overnight. It really adds the most incredible ‘something’ to the dish! Alongside a great stew wild boar makes wonderful sausages! It is often found as the core ingredient in things like salami but also makes the most incredible linked sausage. But it also makes the most wonderful Italian style ragu to serve with pasta. The French call Wild Boar Sanglier and it pops up all over French menus. This roasted whole leg of boar definitely needs to make it to my table real soon! 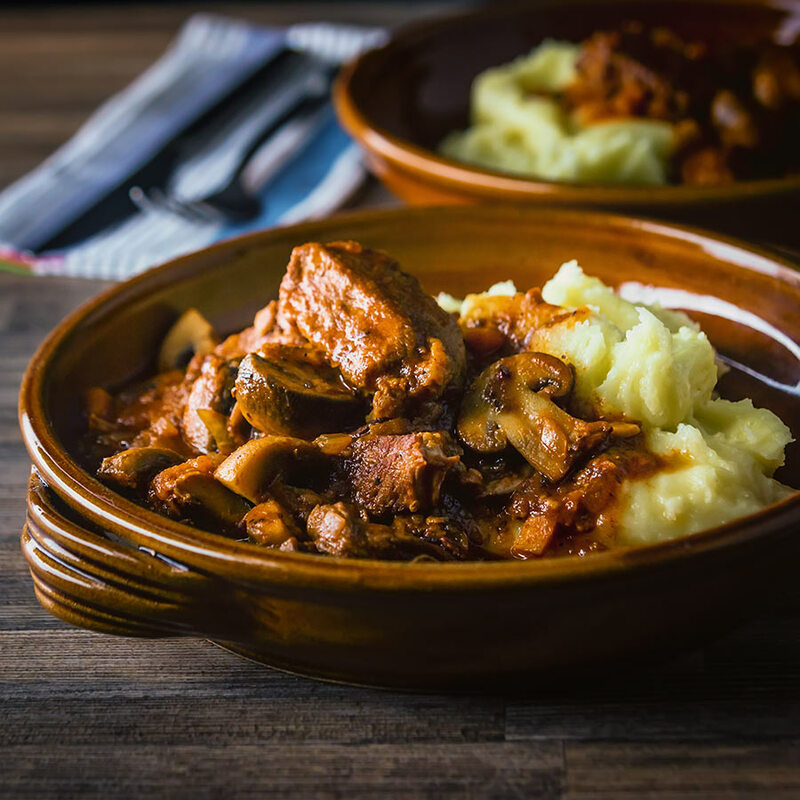 Wild boar is a fantastically underused meat that makes the most wonderful autumn or winter meal, this wild boar stew really show cases its flavour! Add the carrot,celery and onion to the slow cooker. Heat a frying pan over a medium heat and fry off the bacon until crispy. Transfer to the slow cooker ensuring you keep the fat in the pan as much as you can. Season the wild boar with salt and pepper and then add the flour and mix to coat. Now brown the meat in the pan in batches and transfer to the slow cooker. Throw in the garlic to the pan and cook for 60 seconds before adding the red wine and reducing by 2/3rds. Pour in the tomato passata, tomatoes, caraway seeds, bay leaves and marjoram and bring to a boil before adding to the slow cooker. Sprinkle in the paprika and stir before adding 250ml of cold water and stirring and leaving to cook for 6 hours. 30 minutes before serving saute off the mushrooms in the butter and add them to the slow cooker. 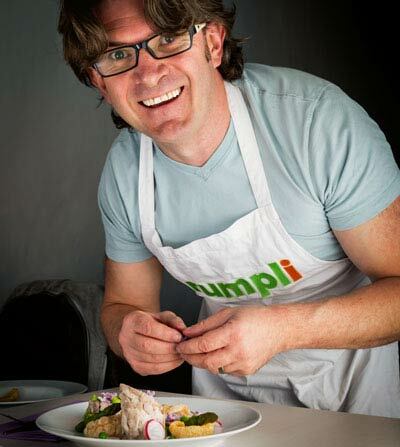 I like to serve with some buttery mashed potato, because mashed potato duh! I am jealous! We don’t have Wild boar around here! I have a question, though. My friend is a homesteader in southern NY and grows a vintage breed of pig, called American Guinea Hog. When she has to remove a boar from her herd, she usually gives them us. We have been using them for dog food. They don’t really taste bad, but they have a hideous odor (of urine) whilst cooking, and I can’t stand it. She says to avoid that, they males must be castrated in the first few days of life. My long winded question, these boar have no lingering smell when you cook them? I would so love to try them! I have heard of boar taint but it is reported to only be prevalent in 20% of male hogs, although it is not just restricted to wild boar it impacts all males of all pig species. Interestingly I read there is a vaccine for boar taint which probably asks more questions than it resolves, however certainly an interesting development. Great photos, Brian! Love the pairing with mashed potatoes too! I have had smoked wild boar in Romania this summer – I loved it – I have not had it since I was a kid and I have to start eating it again as I really love it! What a great recipe – need to see where I could get some wild boar here in the UK – it might not be an easy find. Wild boar numbers in the UK have been climbing after their reintroduction, I have no idea if they are a viable food source as they are here in central Europe though. I have never tried wild boar, but I like the idea that it tastes like a cross between pork and beef. 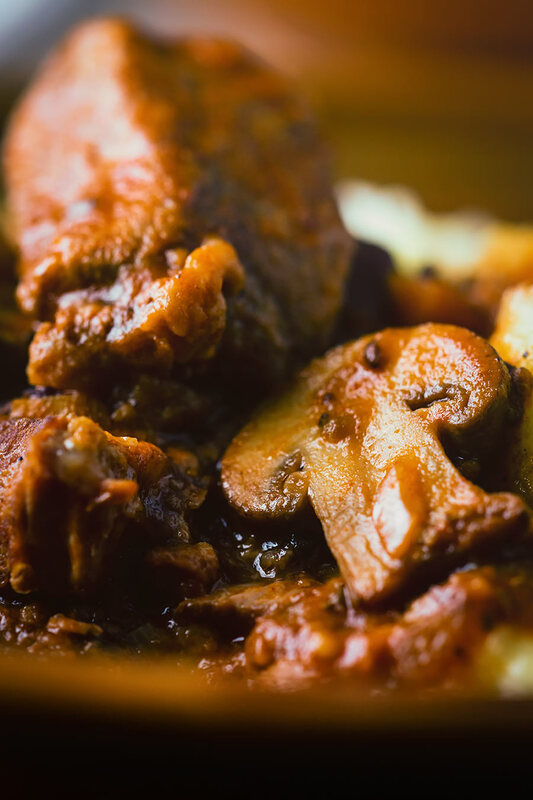 This recipe for stew looks hearty and flavorful – perfect for a cold fall night! This looks to die for! I have only had boar in salami form but am excited to give this stew a try. Now I just need to find boar in my area. The hunt is on! Good luck, I love the stuff! Wild Boar is not something easy to find around these parts, but I really need to try that sauce/stewing concoction! I think this would be a great way to stew a big slab of pork (meat of choice for this guy!) Sounds delicious, Brian. I’m officially starving right now. Thanks Byron, I kinda figured wild boar would not be the most accessible of meats for some but thought I would write the recipe anyway as it is so good. Marinading pork in red wine over night really works although I would dial back on the juniper with pork as it has less robust flavours in itself. Such a perfectly savory dish for Fall weather! I’ve never tried wild boar, but I think I need to! I do hope you can find some Paige, it is a wonderful meat packs so much flavour! i would go “HOG WILD” over this awesome looking dish. I have not tried wild boar either! But I just might have to. Delish! Wild boar is such a fab meat, hopefully I have encouraged just one or two to give it a try. This sounds delicious, though I don’t know where I’d find a wild boar! I’m afraid I can’t help with that… It is pretty easy to get hold of here in Central Europe although you may need to order form a specialist butcher in some places. Another interesting post with flavor combinations that are new to me. Thanks for the recipe. Very interesting. I’ve never tried wild boar, sounds like a delicious dish. I love wild boar, hopefully I have encouraged just one or two to ‘hunt’ some down. What a coincidence. I have never tried wild boar before, but just yesterday I saw it in my local shop for the first time. I guess it’s a sign to try your recipe, ha!